Wednesday drizzle is predicted, I am planning two routes to the Cafe near Andy’s we will select on the day depending on the weather. Friday a trip out to Messing as Barry has made it clear he does not want to meet us in Scarborough. The number female riders has increased which is good news and I have had positive feedback on the Train and Ride ventures both groups have undertaken. As we approach autumn these rides will tail off but next year we will increase the number of ventures to new pastures, so any suggestions please let the committee know. There has been no change in the ride leader situation though Cycling U.K. and Colchester Travel Plan Club are trying to assist. I will not be available to lead rides from the 14th to the 24th September. This entry was posted in Rides on August 26, 2018 by cfprideleader. I am awaiting a date for a minor operation next week, if I cannot take the Wednesday ride out I will make arrangements and book a ride leader. This entry was posted in Rides on August 21, 2018 by cfprideleader. 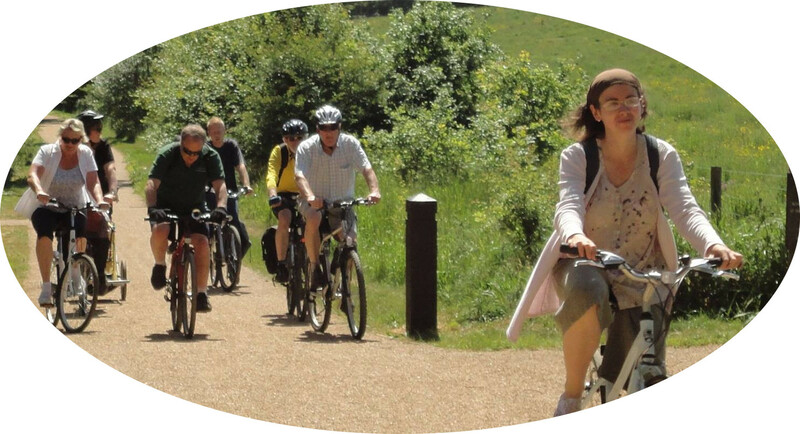 Last Wednesday train and bike ride around Great Bentley was a great success, a big thank you to Ruth for organising. Strictly speaking being on road it was not the norm for a Wednesday and the distance of 9.5 miles before the one and only stop probably made it the longest ride the group has done, but we all enjoyed the new scenery and quite roads. We have no ride leader this Wednesday do to health issues, please meet as normal and I hope Robin and Jon W will take you to Wivenhoe. I may have a very minor operation this week and do not know if I will be out this Friday. This entry was posted in Rides on August 20, 2018 by cfprideleader. This week we will take the train from Hyde Hill Station to Great Bentley for a ride around the village and surrounding areas arranged by Ruth Wyllie. Please note we will be leaving Leasureworld at 10:45 to catch the 11:07 train from Hyde Hill. Tickets are being purchased by CfP, a group booking, we have an open return. This is a bookable event and I must have an Email no later than 15:00 on Tuesday 14th to confirm attendance. If you do not book but still wish to come you will have to purchase your own ticket on the day. Please allow addition time on the day. Friday we will travel East, route yet to be decided, no one got wet on last Fridays ride, though there were some wet non riders. This entry was posted in Rides on August 12, 2018 by cfprideleader. Wednesday is Picnic Day at The Chase Way Leasure Park, if you have not booked you are welcome but please bring your own food. Next Wednesday the 16th we are going to do a Monty Python, something completely different. Please check this site next Sunday for times as we may meet a bit earlier at Leasureworld. From Leasureworld we will cycle to The Hythe Station a take the train to Great Bentley, CfP will pay your train fare, we will be met by our guide for the day Ruth and cycle to a venue in the area for a lunch stop then return to the station for the return trip, please allow plenty of time and check back on Sunday for more info. Fridays ride we will decide on the morning but probably we will go to Abberton. This entry was posted in Rides on August 7, 2018 by cfprideleader.